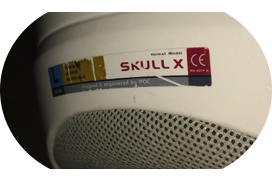 The sticker can usually be found on the back of the helmet. Here are three examples of POC helmets. According to USSA Rule: Helmets designed and manufactured for the particular event of ski racing being contested are required for all competitors and forerunners in all USSA events and official training. Helmets must bear a CE mark and conform to recognized and appropriate standards such as CEH.Din 1077, ASTM F2040, SNELL S98 or RS 98. The translation is that all racers must use helmets that meet the CE designation for Alpine Skiing Helmets. Pictured above are three helmets sold for skiing and ski racing. These helmets were purchased between 2011-2013. All of them bear the required CE sticker. 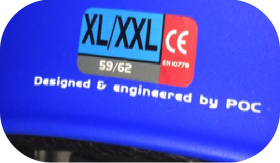 In this case the DIN 1077, standard is referenced on the sticker. The Blue helmet (POC - Bug Recepter purchased in the 2013-14 season) has soft ears and is therefor legal for Slalom Racing in USSA, for all aged racers, but while it bears the required [CE 1077 b] designation, it is NOT legal for GS racing at any age, because it does not have rigid ear protection. The White and Black Helmet is a POC Skull Comp helmet and was purchased in the 2012-13 season, This helmet bears the [CE 1077 a], CE Sticker. This helmet will be legal for U12's and U10's racing GS in USSA. The White helmet (POC Skull -X was purchased during the 2011-12 season) This helmet also features the [CE 1077 a], sticker This helmet will be legal for U12 and U10's racing in GS this season. Note: the CE1077a and 1077b are both designed for skiing, but the 1077a helmets provide more protection to the head. The CE 1077 b helmets have additional ventilation and soft ears. 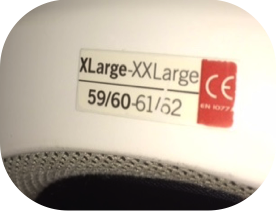 - Required Label attesting that the helmet meets the FIS specifications (GS/SG/DH) - The Label, must be affixed in a non removable way, at the back of the helmet. The label shall in particular not be covered by the goggle strap. The conformity label is shown to the right --->. Note: The Blue helmet, that meets the CE 1077 b standard, is legal for Slalom Racing at the USSA and FIS levels for all ages. 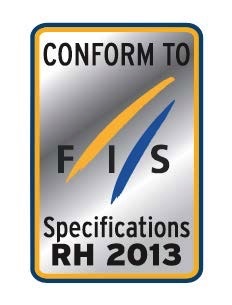 Required for U14 and older Racing in GS, SG, DH in any USSA or FIS races.